On Saturday night, No. 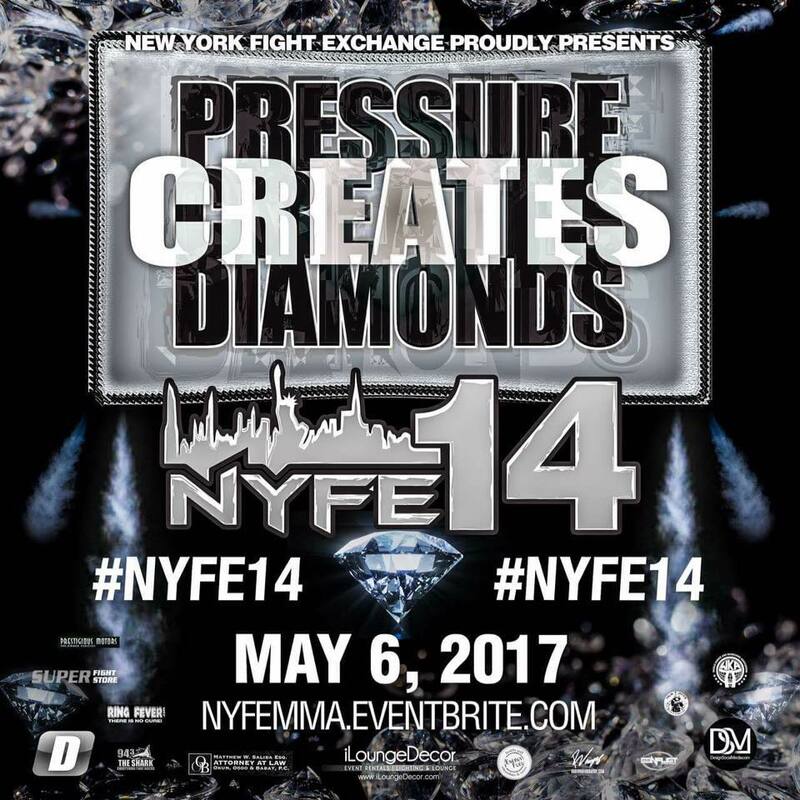 7 ranked Codie Payne (According to MyMMANews.com) will be battling Omowale Adewale inside the cage at New York Fight Exchange: Pressure Creates Diamonds (NYFE 14), taking place at Club Amazura in Queens, New York. This 15-bout event will include No. 10-ranked lightweight Dom Kull, No. 7-ranked welterweight Andrew Stock, NYFE featherweight’s Sean Larkin and Ron Leon, Lightweight’s Ryan Castro and Davon Zimmerman, and Light Heavyweight’s William Knight and Jay Mark. The fights are expected to start promptly at 6:30 p.m. EST. This will be NYFE’s fourteenth event. No. 7 Codie Payne (3-3) will be taking on Omowale Adewale (4-6) in the first round of NYFE lightweight tournament. Payne, now training at Bellmore Kickboxing MMA under trainer Keith Trimble, is excited to showcase his return in front of an expected sold-out crowd. Coming off a loss to Clint Patterson at NYFE 12, Payne plans to battle his way back into the amateur title contentions. A win for the Bellmore Kickboxing MMA fighter pushes his record over .500% and lines him up to face the winner of Andrew Stock vs. Dom Kull. Adewale’s (4-6) Valentine’s Day was Massacred at ECF 13, after dropping his second straight fight. Mike Kelly snagged a first round submission verse Adewale. An impressive victory over Payne would spring the “Black Panther” back into NYFE title contentions and line him up for a second round bout against the winner of Kull and Stock. “You have to be a chameleon in this game. I’m learning to change and adapt on the fly,” Payne said. Fans can expect an all out stand up war between the Bellmore Kickboxing MMA fighter and the Pure Hart Training Center fighter. These two fighters both contain one punch knockout power and aggressive leg kicks. Don’t expect this bout to be much of a grappling bout, though Payne has been training with NCAA national champion and UFC lightweight, Gregor Gillespie. This fight has the potential for Fight of the Night. In this highly anticipated light heavyweight fight, William Knight and Jay Mark will be waking the neighbors with the thunder punches these to monsters will be throwing. Knight, nicked named “Nightmare” for obvious reasons. On a four fight win streak, he’s looking to claim his sixth victory inside the MMA cage. Earning a win, it could be Knight’s final amateur bout before turning professional. Jason Markland, also known as Jay Mark, seeks his third victory of his amateur career. Fighting twice since February 4, 2017, Mark plans to capture the NYFE light heavyweight title from Knight. Knight has been a wrecking ball in all five of his victories, finishing each opponent. The Thornton Martial Arts fighter has four victories by TKO and one via submission. Knight has also been a very active fighter. This bout verse Mark will be Knight’s fourth fight since January of 2017. Knight looks to defend his NYFE title against rising star Jay Mark, in a fight that isn’t expected to go the distance. A win for Mark would rattle the light heavyweight amateur division. The odd’s are against him but a victory for Mark will most likely line up an immediate rematch with Knight. Both fighters are built like brick walls. This title bout will most definitely come down to which athlete has the best cardio inside the cage. If you’re a true fan of MMA, you know that the upper divisions are MEN fighting and require strength, power, cardio, and technique to be successful. It’s a fight you don’t want to miss. Sean Larkin is scheduled to face Ron Leon in a featherweight fight between two gunslingers. Larkin has been the unfortunate victim of numerous fighters pulling out, becoming injured or canceling for various reasons. This young man is probably thrilled that he’ll finally have the opportunity to fight and contend for the title against the current NYFE featherweight champion. Larkin trains out of Commack MMA and hopes to add his fourth victory to his unblemished record. Ron Leon is coming off two straight losses in different organizations and hopes to successfully defend his NYFE title for the first time. Leon trains out of Kai’s Next Level MMA in Ozone Park, Queens, NY. Larkin enters the fight with heavy hands and has finished all of his opponents in impressive fashion. In this title fight, Larkin will face his toughest challenge thus far. Leon is a talented striker and tough grappler. He possesses great cardio and can take a punch. Larkin probably won’t get away with bull rushing Leon and pummeling him against the cage for a TKO in the first thirty seconds of the bout. Leon hopes to climb to .500% with a win against Larkin, bringing his record to 3-3. Larkin looks to remain undefeated in his amateur career and to capture his first title. This featherweight (145lbs) title fight is another fight that has great potential to be Fight of the Night. Fan’s should be stoked about this NYFE title bout. A win for Larkin will land him in the top rankings among fighters in My MMA News featherweight rankings. Ryan Castro hopes to extend his winning streak to two at NYFE 14. After dropping two tough bouts to Clubber Creed (Jude Paulemon) and Paul Thimote, Castro earned a unanimous decision verse Alvin Davis at Golden MMA Championships. A win for Castro will push his record to 6-4 as an amateur. Davon Zimmerman (3-7) is a Massachusetts resident that trains out of Renzo Gracie Connecticut. Knowing that Zimmerman trains out of Renzo Gracie Connecticut, it’s a safe guess he’s a strong grappler and will look to take this fight to the ground. Castro is a fighter that enjoys standing and letting his hands fly. This should be an interesting matchup. Another fight between two exciting warriors. Justin Klein trains out of Team Believe and is currently 2-1 as a fighter. Klein placed himself in title contentions with his majority decision victory over Jonathan Bianco at NYFE 13: Checkmate. Klein will fight Perez Figueroa for the bantamweight title. Figueroa is the current NYFE flyweight champion and seeks to be a double champ. Figueroa is undefeated as an amateur with a record of 2-0. The Anderson’s Martial Arts Academy fighter has won both of his fights by submission via Armlock. Klein’s only loss came by way of submission choke. It can be expected that Figueroa’s game plan is to bring the fight to the ground and submit his opponent. This is another fight with the potential to be Fight of the Night. Anytime you have lighter weight fighters inside a cage, with high cardio, the chances are the fight will be lightning striking at NYFE 14. “We are thrilled about the fight card we constructed for NYFE 14, it showcases the best amateur fighters in the toughest matchup’s representing the elite tri-state gyms. The event will be capped off with three WKA New York State Titles fights. NYFE continues to find the champions of tomorrow today.” NYFE co-owner, Mike Washington said. NYFE 14 is sanctioned by a third-party sanctioning body, the WKA. The World Kickboxing Association is only one of three third-party sanctioning bodies that are granted a license in the state of New York. Fights are set to start Saturday, May 6, 2017, at 6:30 p.m. EST. at the Amazura Concert Hall in Queens, NY. 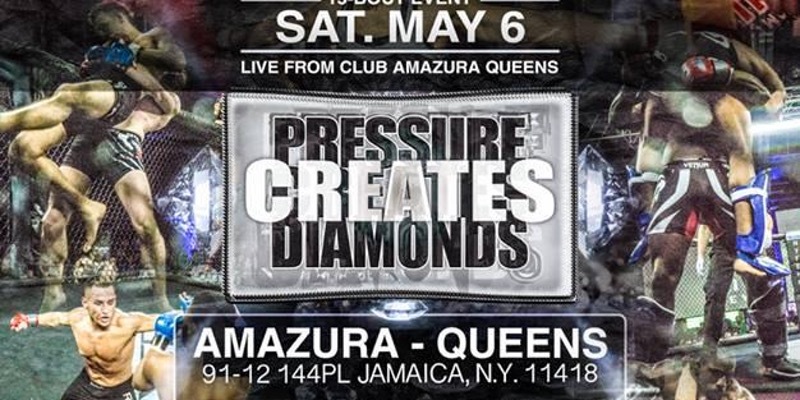 The address is 91-12 144PL Jamaica, N.Y. 11418. Be sure to check in with MyMMANews.com to see the updated rankings of each amateur weight class. Follow My MMA News on social Media at @MyMMANews. Interested in purchasing a ticket to witness one of these amazing fighters battle inside the cage, click here.